4th GRC – moved on! – Design Research. Experience. life. 4th GRC – moved on! Nurul Rahman poster for October GRC2007, seek the image haved been modified from the original add that she found from “Malaysia Year Book 1967”. An advertisment from Strait Central Agencies LTD., myocarditis a travel agency. Another GRC is coming this Oct 22. I decided to changed again my title from “Branding Malaysia? 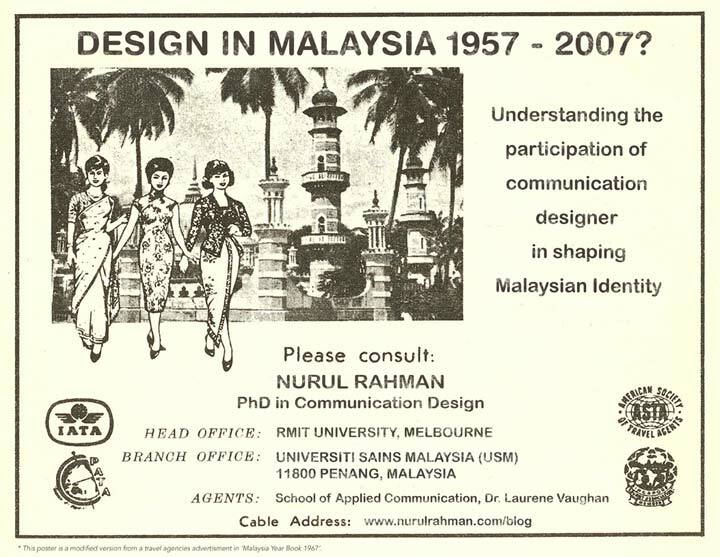 Thinking to understand the evolution of Malaysian Identity 1957-2007” to this new title “Design in Malaysia 1957-2007? Understanding the participation of Communication Designer in shaping the Malaysian Identity”. Why? Well after the trip, I spent time looking at the collection of images that I collected during my field trip in Malaysia. Even during the trip, while collecting the images I realised that I can be out of track somehow if i keep on following the same path. I’m not trying to find Malaysian Identity, or trying to define what Malaysian Identity is/are. This topic is too broad. I’m also not trying to do research about branding in Malaysia. Yes this two topic is very much seductive because this is what i been long to know, but it’s not really what i want to do. I’m a communication designer and a graphic designer. This is my areas of knowledge. I’ve been practicing graphic design, collobarate with others in design, and shared my practices, and knowledge of design with others (students, friends, client etc.) All of this happen when I was living in Penang, Malaysia. Studying and practicing graphic design and creative areas inspired me to seek for more about design. Further more, to be explicit it is all the way about communication design, and not fine art. I’m aware of the lack of understanding about communication design in Malaysia. Therefore, I tried to make some people understand the important of my role as a communication designer in some cases/project in practicing and in teaching. In Malaysia (1994), especially in Penang, it’s very hard to find a designer position for career. I remembered when I told my father (who was a lecturer in automobile engineering department, in one of the college in Penang) that I wanted to study Graphic Design. He responded “What will you be doing after you graduate? A street artist? Can you get a job with this course?”. Wow! that was shocking. But, of course I insisted. I’m lucky at some point because although my father didn’t like the idea of me studying Graphic design, he still encouraged me to go on with what I really want. What I’m trying to say here is, in Malaysia, the term of graphic design is still blur, perhaps not much people know what communication design are. Seriously, I understand the reason why i decided to do my PhD. I wanted to start a design culture in Malaysia. I hope the designer position will be acknowledge and recognise by others as one of the important position in creative department, in advertising department, in school etc. There are not much lecturer have the knowledge in communication design in Malaysia. That the gap that perhaps we can fix. The teaching curriculum strategies in the higher education. I hope somehow and someways I can contribute to Malaysia by having this PhD. In order to do this, I’m will investigate the development of communication design in Malaysia and how communication design participate in shaping Malaysian Identity?. CategoriesProgress work, Why I'm doing this research? Previous PostPrevious ‘Graphic Design’ Versus ‘Visual Communication Design’! What and who is it for? Why I'm doing this research?